Photographer and Designer Joseph Francis works in the visual effects industry in Hollywood. One of his best known early credits was supervising the computer animation for ‘Independence Day’. This weekend he shared with us a bodice he created from our various decorative papers. From the waist down, however, he designed and brought to life on his computer. Truly enticing! Take a peek at some remarkable shots of his process and a more intimate view of the bodice. Fellow HPI staff Joanna and I (Yuki) are now in Tokyo, before our 1-week Washi tour begins next week! 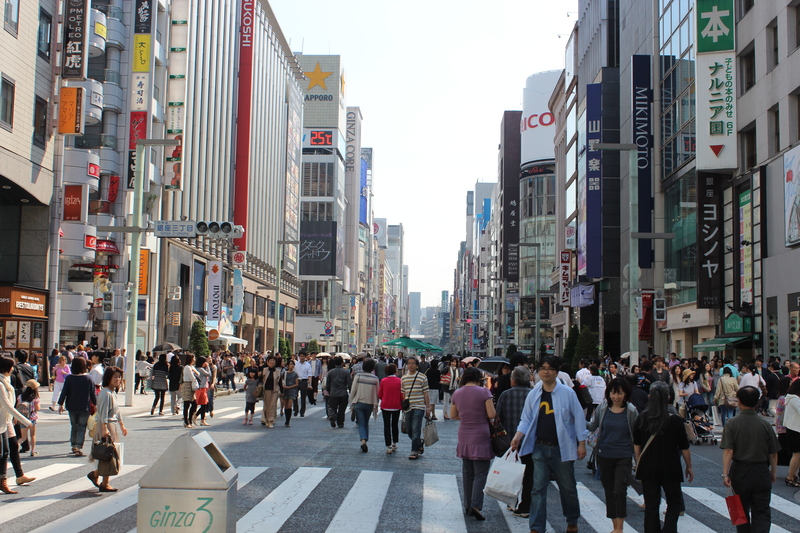 Today, we explored Ginza, strolling the streets and browsing through multiple stores to see what is trending now in Japan. Week long pop-up studio and benefit art sale of Astrid Preston‘s amazing new works. Featuring a vibrant collection of paintings of trees and birds on papyrus and wood veneer (paperwood). The origin of washi can be traced back to as far as 2200 years in China. Envisioning the world map in your head, you can see that to the left of Japan are Korea and China, where almost all of out cultural influences are from, since on the right is the large barrier of the Pacific Ocean. At the time when papermaking made its way into Japan, there was no method of transportation for anyone or anything to make it across this ocean to Japan, causing all new knowledge, information, cultures to come in from the west. Moreover, Fukui Prefecture where we are, served and still is the grand entrance to cultural assets and crafts such as lacquer ware, pottery, cutlery, and textiles, because of its location leading to the then-capital of Kyoto and Nara. “I am not at all a master. The water from this land is magical. The only spirit that I cherish is this: I want to preserve the kozo fibers close to its original state as possible. That is precisely why I do not use any chemicals in my papers. I’m aware that the use of chemicals will exceptionally improve my productivity, but I would like my papers to last 1000 years. That is why I never take the easy way out”. The pride and determination that is behind the papermaking is what makes washi significantly different from western paper. The Japanese department store Takashimaya is celebrating their 180th anniversary with displays in store in windows using decorative Echizen Washi. The celebration ends October 14th. For those of us not in Japan, here are some images Hiromi had captured on her trip to Tokyo. Today’s origami is a Crows Beak! The crow is regarded as one of the most intelligent animals, but the symbol of a crows beak is considered to express misfortune. Even so, these fun little origami beaks are mobile and great to play around with or to use as decoration – no jinx intended! Hope everyone had a great Fourth of July Monday!